The City of Cape Town Office of Sustainable Livelihoods has a goal of providing energy efficient products to the ‘poorest of the poor.’ In order to effectively distribute such products to this market, we developed an Entrepreneurial Initiative that can continue with little outside funding and support. 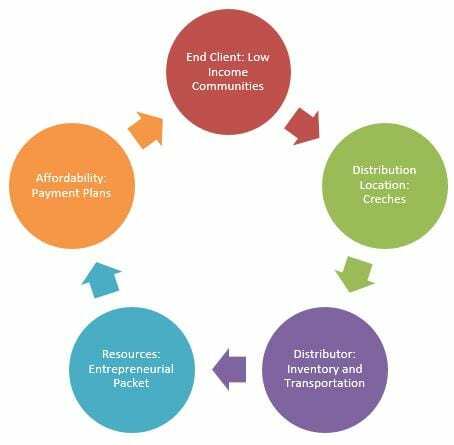 At the core of the initiative is a business model that addresses the end client, distribution location, distributor business start-up resources, and affordability. The following sections describe each aspect of the Business Model, which we feel is appropriate for low income communities throughout South Africa. Energy practices in low income communities produce a variety of safety risks, health concerns, and economic strain. One of the biggest problems is shack fires caused by candles, paraffin, and other makeshift energy practices, like gulleys. Shack fires can burn down a household in less than a minute, spreading rapidly through a community (Town, 2014). This happened three years ago in the Flamingo Crescent informal settlement, a community where we held interviews. Health implications also arise from the current energy practices, specifically cooking and heating. When paraffin stoves are used inside the shack, smoke builds up as there is limited ventilation. This indoor air pollution results in respiratory illness as community members in two different informal settlements shared with us. Lastly, cost is an important factor when it comes to energy. Low income community members continue to use these unsafe energy methods since they are the cheapest. For example, a liter of paraffin costs R13.50 and is only enough to cook a household about two meals, but is most commonly used in non-electrified houses. This led us to realize that a market for safer energy efficient products does exist in informal settlements. Therefore, our Business Model aims at bringing to this market energy efficient products that can address the health and safety risks associated with the current energy practices, as well as help reduce the economic burden on low income community members. Crèches are a promising location to sell Wonderbags and other energy efficient products because they have fee-paying customers, are respected places within the community, can demonstrate the products’ capabilities, and are already established businesses. A crèche attracts parents looking out for the safety and best interest of their kids; therefore, the parents, specifically mothers, are more likely to purchase products that can give their children a better future. Additionally, a crèche is a trusted, central location in the community. Since customers are more willing to buy products from someone they trust, guardians are more likely to buy products from crèche leaders that care for their children. Community members whose children do not attend the school also know where the crèche is located and can purchase products there. The crèches can also use the products, which demonstrates its benefits and capabilities, a key part of making a sale. Finally, the crèche is an established business. In most cases, selling energy efficient products cannot be the entrepreneurs sole business because of the investments needed and unsteady rate of sales; therefore, incomes from the crèche and distribution business can supplement one another. The crèche leaders have experience running a business making them ideal candidates as energy product entrepreneurs. A first step in developing this business model was understanding possible ways to finance sales in low income communities in South Africa. We began by researching different finance methods used by small businesses in developing countries – microcredit, microfiance, and microconsignment – during our preparatory term. Once we arrived in Cape Town, we held meetings with the local Wonderbag distributor and potential entrepreneurs to collaboratively determine the best finance model for distributing energy efficient products. The methods of paying for and obtaining inventory are critical considerations for entrepreneurs. Both must be tailored to fit the needs of entrepreneurs in low income communities to prevent economic strain. Since many entrepreneurs in these areas do not have the financial means to front the money to purchase products, providing the inventory on microconsignment is attractive because there is no initial investment as payment is instead made after products are sold. Also, community members do not always have access to transportation, so it is difficult to get the inventory if the products are not delivered. Therefore, the product distributor must be able to bring the products to the crèche to fill the transportation gap. The financing and delivery of inventory is an essential part of making the business model work in low income communities. An Entrepreneurial Support Packet further develops the crèche leaders’ business skills through a variety of resources that are graphic-based to facilitate understanding across literacy levels and language barriers. These provide the support for managing inventory, recording sales, and advertising. Energy efficient products can have high initial costs. In order to make them affordable to the end clients and aid the entrepreneurs with their sales, payment plans were created. These allow the customers who did not have the means to pay in full upfront to pay in two smaller payments within two weeks. The figure below depicts the two Payment Plan options available during the Pilot Programs. The customer had the option of either paying all R210 for the Wonderbag at once, as seen in the top row, or making two payments of first R110, when they received the Wonderbag, and then R100, show in the bottom row. Most people used the Payment Plans to help offset the high initial cost of the Wonderbag.